Kampong Chhnang is a little-known provincial capital about 90 kms from Phnom Penh. It has never attracted much interest from Western tourists, though NGOs do run a lot of projects in the area- when we were in town the only other Westerners we saw were NGO types. We headed out here in the rainy season in 2012, when the rivers and lakes in this part of the country were all full to overflowing from the monsoonal rains. The bus trip from Phnom Penh took about two and a half hours- the Cambodians do most things at a leisurely pace. We stayed at the Sovan Phum hotel, which is the said to be the best in town. It was a typical Cambodian business hotel, charging $15 a night for a clean room with AC and a comfortable bed. The hotel lobby with filled with the kinds of decorations which we have dubbed amongst ourselves as “Cambodiana”. There were, for example, carved wooden reliefs of the profile of Angkor Wat, a number of highly lacquered Buddha statues and the head of a Khmer king with his hair done in a large top-knot. The material of choice for all of this was tropical timbers, which explains why you rarely see any jungle left in most Cambodian provinces these days. There isn’t much to see in town. Fans of colonial architecture will enjoy the governor’s mansion and there are some old French-era shophouses with crumbling masonry along the waterfront. You can also find some old French-era villas, many of them housing various charity projects and NGO offices these days. But there is nothing like a cohesive “old town” and not even the most avid of history buffs is likely to be diverted by these pickings for long. The only real attraction in Kampong Chhnang is its riverside port, and this really does have a bit to offer for those in search of exotic “colour”. In the rambling markets along the waterfront, you can find fish, fruit, vegetables and various plant products which have been harvested in the shallow, swampy waters around the town. Of more interest is to hire a rowboat or speedboat and head out to the floating villages in the area, however. Surprisingly, this part of Cambodia is home to a mix of ethnic groups. Apart from the local Khmer (Khmai) there are also considerable populations of Viet and Cham peoples in the area. Many of the ethnic minorities live out in floating houses on the waters around town and a boat tour of these floating villages is a very worthwhile way to spend an hour or two while in Kampong Chhnang. Here you will find people with their families, pets and even gardens all on floating raft-houses. Children swim between the houses, splashing around and laughing, while some of their peers paddle themselves home from school in a floating drum! You can also see Cham mosques and small Viet temples out in these floating communities. During our leisurely drift around this villages, rowed by a Vietnamese woman in a pointed rice-framer’s hat, we felt we had lost the modern world and gone back to an earlier time. The relaxing trip was made even more pleasant by the views of forst-coverd hills in the background, seeming almost like mountains in that flat, watery world. On the far side of the harbour you can rent a motorbike or tuk-tuk onwards to Prasat Srey, an obscure Chenla-era temple which is about 17km past the river. 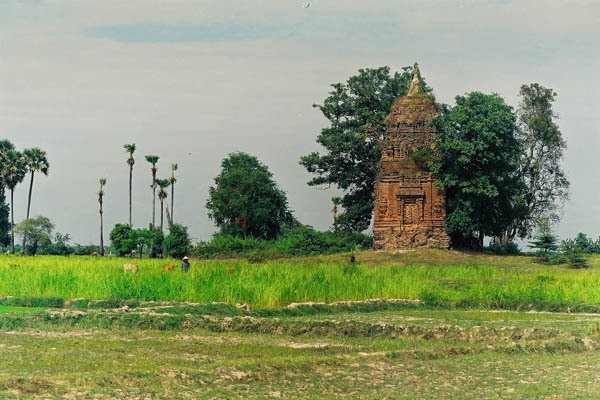 It is in a very dilapidated condition these days, but the red-brick tower still has an identifiably Khmer appearance, resembling the smaller Chenla shrines at the site of Sambor Prei Kuk near Kampong Thom. The best-preserved feature is the “false door” motif, which is shown quite clearly in the picture below. These days it is surrounded by rice paddies and is embraced by the branches of a large tree. It is a lonesome reminder that this backwards province was once a centre for the Chenla kingdom, which ruled Cambodia during the seventh and eighth centuries.